Scalamandré has re-colored, re-scaled and re-styled some of its cherished classics for a more modern look. 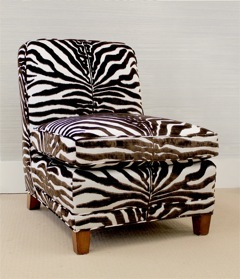 El Morocco’s bold hand-printed linen zebra made with lush cut velvet silk pile features stripes staged in relief on a cotton ground and comes in hues of Espresso, Latte, Fog, and Cappuccino. The season’s must-have, El Morrocco was named after the celebrated Manhattan night club frequented by cafe society. 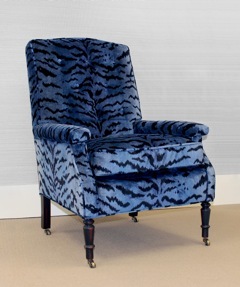 With an updated palette of twilight and dusk, the Tigre chair is made with luxuriously rich velvet of 100 percent viscose pile. With exquisite trompe l’oeil detail, Tigre continues to captivate. 800 N. La Cienega Blvd.